With influences ranging from Jim Hall to Jeff Beck to John Abercrombie, it is only natural that Rik Wright Fundamental Forces, Blue would be the driving tonality of his latest endeavor, but one has to take this one step further and recognize that compositionally elements of Charles Mingus are present. Like Mingus, Wright’s compositions retain the hot and soulful feel of hard bop, while sometimes drawing on elements of third stream and/or fusion. Almost a fused tradition with unique and unexplored realms of jazz; keeping one foot in tradition, while the other foot is stepping into the future. Wright’s style of writing though very modern and forward in style, still captures a melodic yet catchy sensitivity. “Mood Ring” highlights a sixteen note pulse, which finds Wrights guitar in unison with DeJoie’s reed instrument for the first statement of the melody, giving the cut a dark, yet provocative impression. James DeJoie a major influence as well in the tonality of the proceedings plays clarinet with agility and clarity. On “The Butterfly Effect,” DeJoie’s alto solo soars. The combination of Wright and DeJoie as soloists on this outing elevates the overall effect. On “Nonchalant” DeJoie is featured on bass clarinet, again adding to the uniqueness of the cut. On “Parting Ways” he plays a flute intro with a distinctive Asian overtone. Wright’s guitar is a fantastic foil and complements the reeds on each cut with crisp gentle chords, all the while with Geoff Harper (bass), and Greg Campbell (drums, percussion), creating a solid and forward rhythmic foundation for both Wright and DeJoie to expand their ideas upon. The final track “Miss Thing” takes it a bit more avant/third stream with spacious guitar, chiming sounds sparsely coloring and relaxed drum colors, add a raspy alto solo from DeJoie that builds to a frenetic pace and an almost Jimmy Paige affected rock guitar solo from Wright, it is a fitting emotional release to the overall picture. 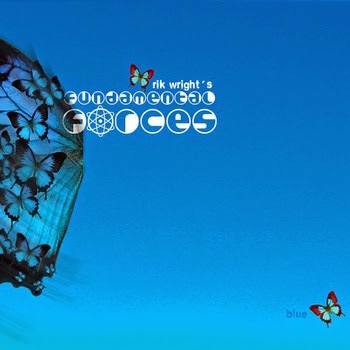 Rik Wrights Fundamental Forces, Blue is a highly recommended listen, especially for a jazzer that enjoys grit. Be the first to comment on "Rik Wright, Fundamental Forces, Blue"